Come early to experience the awakening of Spring and the parade of migratory birds and wildlife. Plan a getaway from Labor Day thru early October to celebrate the vibrant colors and crisp days of Fall. Special pricing and packages available before Memorial Day and after Labor Day. For Senior Citizens, we offer a 10% further discount off Fall Rates. 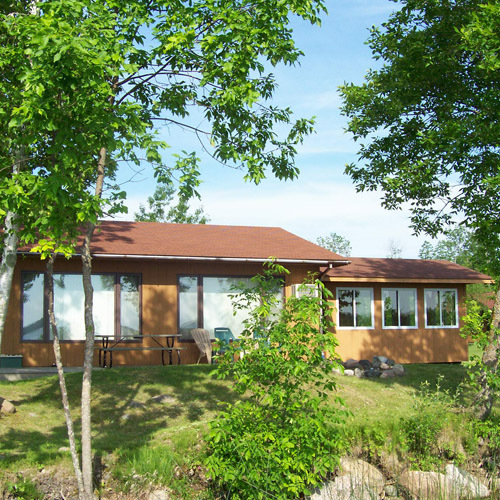 Moose Lake Resort offers 12 private, lake-side cabins accommodating various size groups. Each comfortable cabin offers privacy and modern amenities and is fully-furnished, including bedding, cooking and eating utensils, air-conditioning, charcoal grill, a private dock and boat, picnic table and fire pit. Guests are asked to bring their own towels. There is a boat launch, and motor and pontoon rentals are available. A laundry facility is available for guest use. Our friendly staff can help guide you in planning your stay. Check-in is 4pm on Saturdays and check-out is 9am the following Saturday during “Peak Season”, and two-night minimum stay during our “Off Peak Season”. Our facility is smoke-free and we do allow pets in a couple of our cabins, with an additional deposit. This cabin is situated closest to the lodge with view to the South over the bay. It offers two bedrooms (one king or twin separates, two twins), a sleeper sofa and ¾ bath. This is one of bigger cabins and is closest to the beach area. It offers three bedrooms (one queen, four twins), sleeper sofa, two ¾ baths and deck. Wonderful views down the lake and of the bay, directly on the point. This cabin offers two bedrooms (one queen, two twins) sleeper sofa, a ¾ bath and deck. Beautiful view to the east and breezy afternoons from this cozy cabin. Loonlook offers two bedrooms (one queen, two twins), sleeper sofa, a ¾ bath and deck. Good Morning Sunshine! Great views down the lake to the east. This cabin offers a cozy one bedroom with queen, a sleeper sofa and a ¾ bath. Private with easterly views down the lake. This cabin offers two bedrooms (one queen, two twins), sleeper sofa, two ¾ baths, a large screen porch and deck. For our nostalgic visitors we offer this one bedroom rustic log cabin, with one queen, two twins and a detached ¾ bath. In the heart of the resort campus, this cabin offers three bedrooms, (one king or twin separates, four twins), sleeper sofa, a ¾ bath and spacious screen porch and deck. Very spacious and private. Northwood offers four generous- sized bedrooms (two kings or twin separates, two twins, one queen), kitchen with bar, dishwasher and large dining area, sleeper sofa, four ¾ baths, a large screen porch and deck. Situated approximately ¼ mile from the main resort campus, Red Oak is on the lake in a private park-like setting. Large and recently remodeled, this three bedroom, (one king or twin separates, one queen, two twins), three ¾ baths property offers a gourmet kitchen with dishwasher, laundry room, rec room, sleeper sofa, deck and garden patio. Situated approximately ¼ mile from the main resort campus, Westwood has a private dock and is 80 feet from the lake in a very private park-like setting with views down the lake to the East. A new master king suite is available for an additional $470 per week. Situated just over ¼ mile from the main resort campus, Southwood is on the lake in a private park-like setting. This cabin offers two bedrooms (one queen, one king or twin separates), a full bath, dishwasher, a sleeper sofa and deck.